For over 56 years, Abey Australia has been synonymous with quality and innovation, bringing the latest designs and technology to Australia. With over 1,200 products, Abey's range is a result of consistent and on-going product development with a focus on innovation and quality. 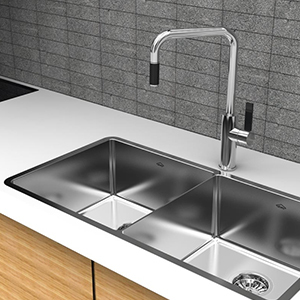 Offering the largest range of Kitchen and Basin Taps and Sinkware in Australia as well as exclusive Italian collections including Gessi, Armando, Vicario and Barazza Appliances. Abey are renowned amongst designers and architects for there ability to supply a complete Kitchen and Bathroom package to compliment all designs and budgets.